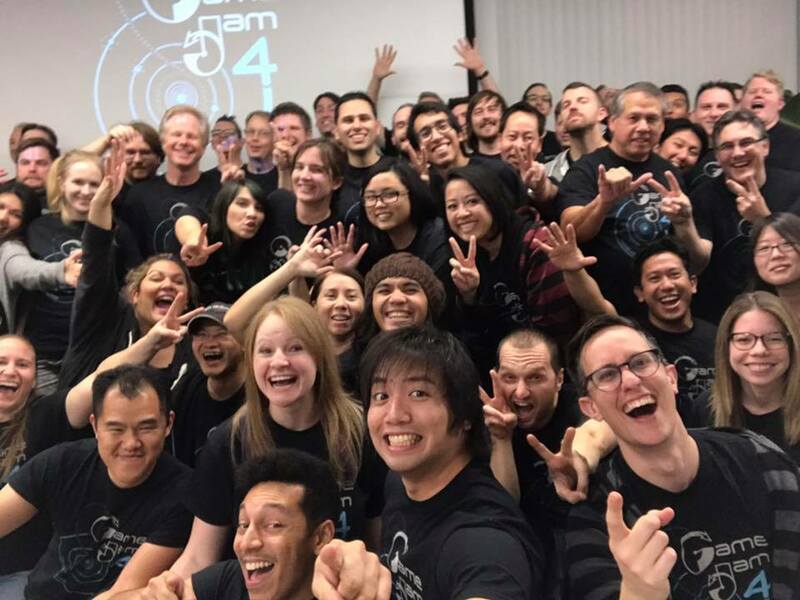 One of the coolest things MobilityWare does every year is a weeklong game jam. On Friday, people get up to pitch an idea for a game, and then employees team up and get to create it over a week. I’ve participated before (and went for multiplayer which is always a ridiculous game jam choice), but this year I decided to pitch! Since doing our own game jams and watching our cats in moments of thoughtfulness, Robert and I thought it would be hilarious to do a game about cats fitting in boxes. I thought a tangram-style game with a twist would be perfect for it and pitched alongside Rob. A really grea team formed and we were off. Over a week we developed the game. My biggest focus was on the level creator. I wanted to make sure we could have the tools to create a bunch of levels as I felt this was going to be incredibly important to the demo. We ended up with a really neat little system that exported to json and were able to create 61 levels for pitch day! Our level designers worked really hard on the intro levels and were able to get away without any sort of guided tutorial. 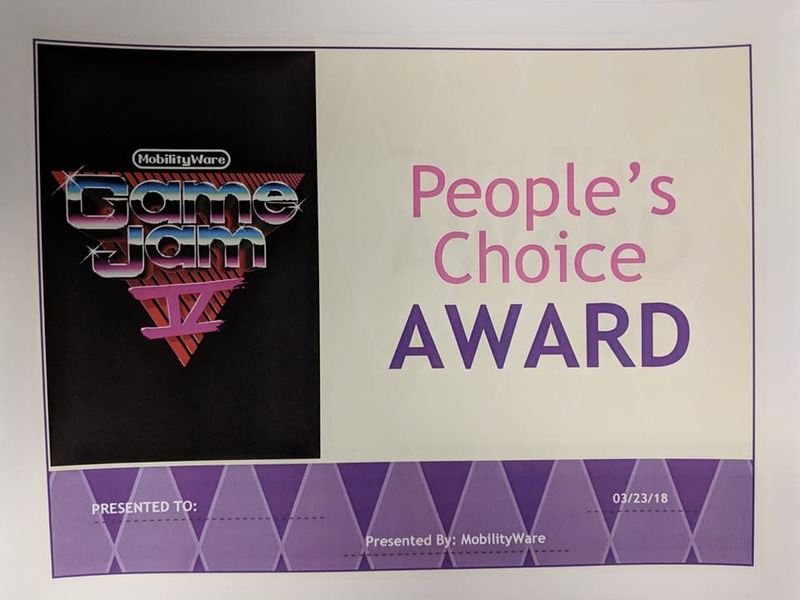 To our delight, the team won the company’s vote for best game (the People’s Choice Award). Then, our game got picked to be developed for the Facebook Instant Games platform!! That team was really great at keeping me involved throughout the process. The final game ended up being super close in mechanics to the initial design which was also really neat. It’s definitely been one of my proudest moments as a game dev. All my friends loved it and several got pretty addicted. It peaked at 188K daily active users! Wow, it’s been 3 years since I started at MobilityWare! In March of 2016 I found the lovely gem of a company. I was hired as a Software Engineer to work in Unity on Casino-style mobile games, and have loved it ever since. MobilityWare has the oldest and some of the largest card & jigsaw puzzle games on the mobile market. It’s really rewarding to board a plane and almost always see someone playing one of our games! One of the most exciting parts is I’m finally working professionally in Unity. Back in college, we gave Unity a shot at version 3.0. Ever since then, I’ve used it for student projects and game jams and always really loved it. Now I’m finally getting to really deepen my knowledge of the platform which has evolved an incredible amount since first trying it. Currently I’m working on Vegas Blvd Slots, a mobile slots game. I’m really enjoying learning about the crazy amount of depth that goes into these machines from every aspect. Between great coworkers, game jams, annual trips, and company-sponsored events such as volunteering I’m super grateful for a place that can be pretty rare in this industry. And check it out – I even got an interview on the company’s blog! Woo hoo major life update! 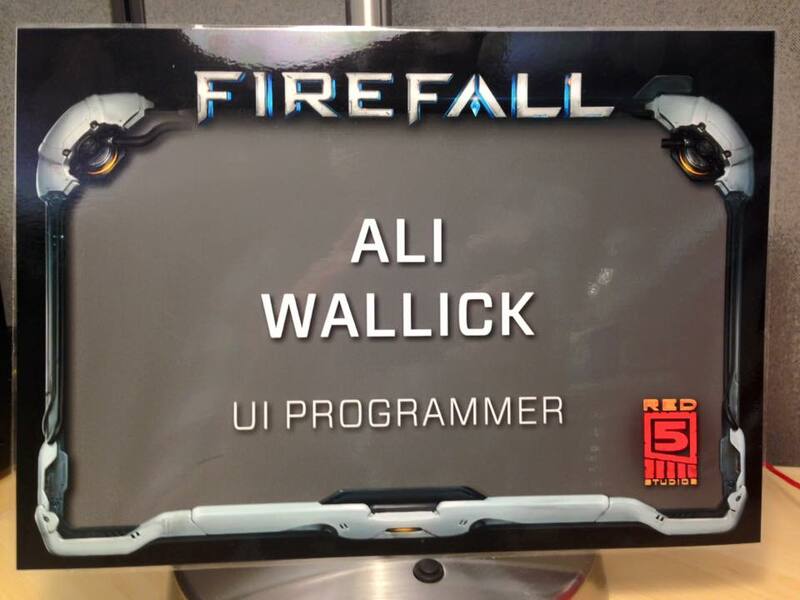 In April 2015 I was contacted by Red 5 Studios about a position as a UI Programmer on the game Firefall. Finally ready to make my pilgrimage across the country like the rest of my college peers, I gladly accepted. Within a month I was packing up my life, my pets, and my now-fiance (fellow game developer Robert Spessard) to move to my new home in Orange County, California. My first 6 months at Red 5 and on the West Coast have been great. I’m super excited to be a part of a huge overhaul to Firefall that will be released in the near future globally. I’m learning a ton every day, and am grateful to have some new amazing coworkers and friends. I miss Atlanta dearly, but am thrilled about this new adventure I am undertaking. Thank you to all my family and friends who believed in me and helped me get to this point! Well, it’s been a busy year! My last post was a year ago to the day. After Global Game Jam 2014, I headed out to the Game Developer’s Conference in San Francisco. It was a great time and super motivating as usual. This time I even stayed an extra few days and got to go camping and visit Yosemite! I also fulfilled my dream this year of adopting a puppy, whom I have been raising into a dog for 9 months. I took a couple Coursera classes as well! The Hardware/Software Interface course was brilliant and I highly recommend it to anyone that wants to learn some more low-level programming. At work, I’ve done some exciting projects. With the introduction of a new game mode, the HUD was due for a revamp. I got to head up the process, giving input on the design, and creating a design document for the code architecture for my teammate and I to work on. I saw this project through to release and several additional phases/updates. I worked on several other things throughout the year, but my favorite was a menu animation system for the team. Previously, the menu system was extremely static. Animating a menu or control was a tedious process. Now we have a tweening system that allows a coder to tween location, size, and alpha over time. The system is already in use on several menus created by myself and others! A few weeks ago, my usual team got together to discuss the 2015 jam and we decided the best use of our time would be learning a new engine. I have been wanting to jump into Unreal for a while, and with UE4 released and affordable, now seemed like the best time to get ahead. For the week before we devoured tutorial video after tutorial video, but jumping straight into the engine to make a game taught me far more. Overall I’d consider the weekend a success. We scoped for a game in an engine we knew, but despite that the team managed to come out with a very workable prototype and (more importantly) a thirst to learn more. This is what I enjoy most about game jam – it’s like a shot of motivation every year! I found Unreal extremely enjoyable to work in. I’m still wrapping my head around the various standards within the engine, and learning how the C++, Blueprints, and other features work together, but I learn more every time I open the project. The Blueprints were really cool to work with, and I found myself reminded of some of my favorite childhood games like Widget Workshop or Incredible Machine. If you want to know more about the game itself, check out my project page, or the global game jam site! I had such a great Global Game Jam this year! It started with several of the people from my previous team, and later added some fresh faces! After some discussion we settled on our inspiration: Don Quixote. In the story, Don Quixote sees the world through his obsession with chivalry, while his companion Sancho sees things as the “regular” world. In the famous scene Don Quixote sees windmills as giants despite the protests of Sancho. In the game, one player plays as Don Quixote and the other as Sancho both riding a horse through a continuously scrolling third-person world. Don Quixote’s main goal is to attack the “giants” (and other monsters) he sees. He has main control over the horse and is able to throw his javelin. Sancho is trying to prevent Don Quixote from hitting windmills and can do so through “nudging” the horse. The nudge’s power is controlled through a meter which fills up over time. Don can also throw rocks to destroy “real” enemies. The game’s mechanic ends up being using careful timing to either hit or dodge enemies or innocuous objects to gain the most points. Obviously, we had a fantastic art and audio team who really brought the game to life! Already the game has been ported to iPad, and we look forward to adding some more polish as time goes on.